How many of these places have you visited in the United States? One of the challenges in writing a blog over a period of several years is that you tend to change styles and focus as you go along, meaning that revisiting your blog from time to time can be quite enlightening. You discover, for example, that you have misplaced a link to one of the older posts. That is what has happened to a piece I wrote back in 2007. 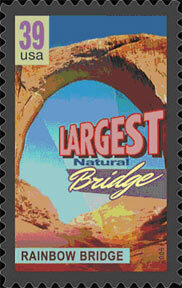 I had a post with questions about places in the United States that were “superlative,” according to a set of US stamps. However, when I changed the host of the blog and made changes to the website, I left out a page of answers to questions I asked four years ago. So today I’m going to give you the answers in case you have stumbled upon the May 7, 2007 post that asked you what you thought were the biggest, tallest, widest, windiest, etc. places in the United States and wanted to know the answers. As you consider these places, remember, as my husband is always pointing out, that anything can be “superlative” if you add enough qualifications. For example, my house is the only house on the block that has a blue door with leaded windows on either side. I am the only one in my family who graduated from graduate school in 1984. What qualifications can you give yourself to make you a “superlative” person?